Performing at the iTunes Festival, London's Roundhouse on Thursday 15 July 2010. Performing with the Bolívar Soloists at the iTunes Festival, Thursday 15 July 2010. Mexican tenor Rolando Villazon and Female Artist of the Year Angela Gheorghiu pose at the Classical BRITs 2010. Performing at the Classical BRIT Awards 2010, Royal Albert Hall. Photo by Simon Fernandez. With Katherine Jenkins, his fellow mentor on ITV series Popstar to Operastar. Rolando Villazón and Nino Machaidze perform on stage during the rehearsal of 'Romeo and Juliette' on July 28, 2008 in Salzburg, Austria. 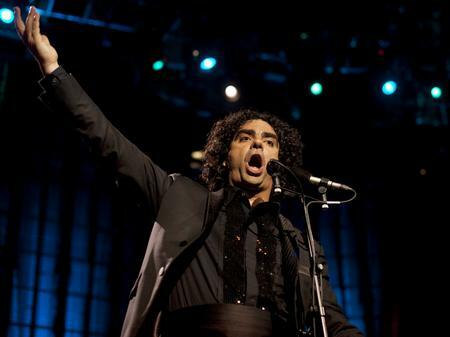 Mexican opera singer Rolando Villazón performs at the German television show 'Wetten Dass' in the eastern German town of Erfurt on March 29, 2008. TV host Thomas Gottschalk and opera singer Rolando Villazón perform with a bavarian band during the 'Wetten dass...?' show at the Olympiahalle on March 21, 2009 in Munich, Germany. Spanish tenor Placido Domingo poses with his Bambi category 'classic' after Mexican opera singer Rolando Villazón handed it to him during the 60th edition of the Bambi media prize awards ceremony on November 27, 2008 in Offenburg, western Germany. The awards ceremony takes place every year under the patronage of German publisher Hubert Burda and awards nominees in the sectors of communication, entertainment and show business as well as economy, politics and sports. Rolando Villazón, in the role of Romeo, performs during the rehearsal of Charles Gounod's Opera 'Romeo et Juliette' directed by US Barlett Sher on July 28, 2008 in Salzburg. Rolando Villazón performs during the final of singer qualifying contest 'Musical-Showstar 2008' on April 18, 2008 at the Coloneum in Cologne, Germany. Russian soprano Anna Netrebko and Mexican tenor Rolando Villazón wave to the audience at the Derby-Park in the northern German city of Hamburg 14 July 2007. Netrebko shared the stage with Mexican tenor Rolando Villazón at the start of her tour. Mexican tenor Rolando Villazón performs with Russian soprano Anna Netrebko on stage at the Derby-Park in the northern German city of Hamburg 14 July 2007. Netrebko shared the stage with Mexican tenor Rolando Villazon at the start of her tour. Rolando Villazón performs during the 'Wetten dass...?' show at the Olympiahalle on March 21, 2009 in Munich, Germany.